Market experts say that there is huge marketing potential in rural market. Brands, be it apparel, auto, cosmetic, food and grocery, consumer durables or FMCG are heading towards rural markets. A large chunk of India population stays in the rural areas. Though it is clear that with huge population and growth of economic conditions of rural consumers, the rural market has huge potential that is largely untapped but catering to these consumers is not as easy as compared to urban market consumers. 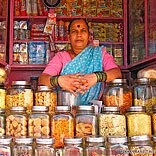 Consumer behaviour in India changes at every few meters. The fact that there exists many India in one India makes it difficult for companies to standardise the marketing strategy for brands. The major growth driving consumers are from middle income group. They are the consumers of today and will drive the future growth of Indian market says, Ireena Vittal, Partner, McKinsey & Co. Localising or adding local flavour to the product or services will help companies to connect with the rural consumers. Brands need to create business model standardised for rural market to create consumption. Rural market is shifting from loose goods to packaged goods format, says Pradeep Kashyap, Founder and CEO, MART. The consumers are no more looking for affordability of products but are moving towards economic packs. There are households with multi brand products either used by different family member or same person using multi brand products. This has given platform to many regional brands going national. Regional brands take decision on gut feel rather than on numbers, say Kashyap. They take decisions that are simple and quick that leads to their success in rural market. Creating brand awareness among rural consumers is little difficult from the urban consumers. Marketing to urban audience is easier due to their acceptance of media and its various forms that are present in urban areas. The issue faced by companies in rural market is the fact that a large rural population is media dark. Traditional media such as TV and print reach out to only 40 and 45 percent of the entire population respectively. Reshaping or modifying the product category or creating new product line based on needs of rural consumers would help players to create consumer base. Consumers are always willing to try out new products. Rural market is highly price sensitive and understanding price positioning for rural market is critical. A frequent raise in price will not work in rural market instead it will minus your consumer base. Infrastructure continues to be a challenge in rural India. Reaching rural market is difficult for companies due to problem in road infrastructure. The lack of an efficient distribution network prevents penetration of products into rural market. However, with the recent growth and innovation in IT and technology sector, it will serve as a breeze to connect companies to rural market. The rural market has huge untapped potential. The potential buyers of the market are middle income group who will be future growth drivers of the market. In order to strength the market share in rural India, companies need to understand the consumers first. A market research, consumer survey or frequent visit to consumers would help in understanding consumers’ psychology.